Can you see the marine iguanas (Amblyrhynchus cristatus)? They blend in so well with the sea-side rocks. They are cold-blooded, so during the day they huddle in groups and bask in the equatorial sunlight to raise their body temperatures. The Internet tells me a group of iguanas is called a “mess,” and this mess on Fernandina is the very picture of warmth. 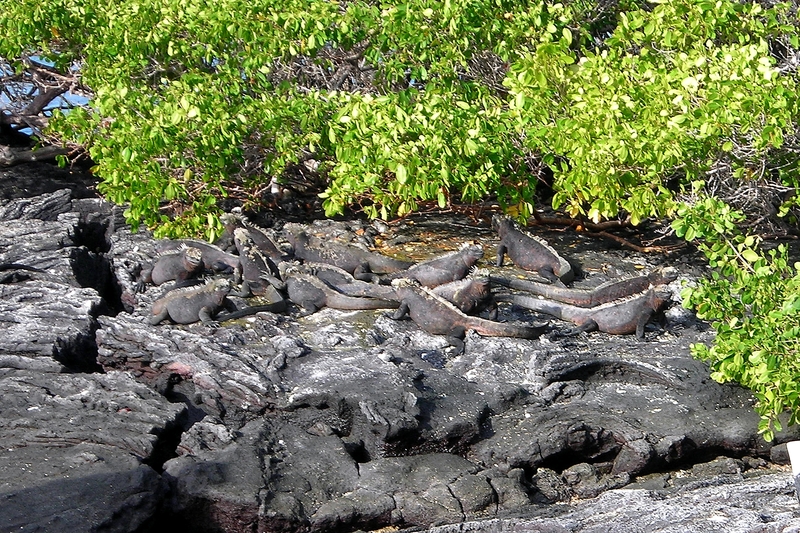 The volcanic rock is fairly bare, but behind the iguanas are mangroves, which are very common on Galápagos coastlines, being mobile (mangrove seeds are buoyant) and also well able to tolerate salt water. I’ll admit I had to look twice, but saw them before reading your text. Cool shot! !